He was the bad boy heartthrob of Beverley Hills 90210, the James Dean of the 1990s. He was a colon cancer awareness advocate. He was the father of two. He was Luke Perry. And on March 4th, 2019, at the age of 52, he died of a massive stroke. This news has rocked the pop culture nation, and has many people asking why did Luke Perry get a stroke at such an early age? What are the warning signs of a stroke? Can strokes be prevented, treated? Are you at risk for a stroke? A stroke occurs when the proper blood supply to a portion of the brain is cut off. According to the American Heart Association's 2017 heart disease and stroke statistics, 795,000 strokes occur in the United States each year. And seven million people who live in the United States have had strokes. The average age when a stroke occurs is actually decreasing, it's getting younger. For women, the average age is 73, and for men, the average age is 68. Being over the age of 40 in and of itself is a risk factor for strokes. There are two types of strokes, an ischemic stroke, and a hemorrhagic stroke. An ischemic stroke occurs when the blood flow to an artery that supplies the brain is blocked if it's clotted off. And there are actually two types of ischemic strokes, there is a thrombotic stroke, which occurs when a plaque or fatty deposits block that brain artery and cause a decrease in blood flow and oxygen to that portion of the brain. And then the other type of ischemic stroke is an embolic stroke, which is when a plaque or a clot travels from outside of the brain into an artery that supplies a portion of the brain. Some sources of embolic strokes include the neck arteries or the carotid arteries. If ever you have a plaque or a clot in a carotid artery, it can travel from that neck vein into a brain artery, causing an embolic stroke. Another source can be the heart, especially for patients who have diseases like atrial fibrillation, or AFIB. 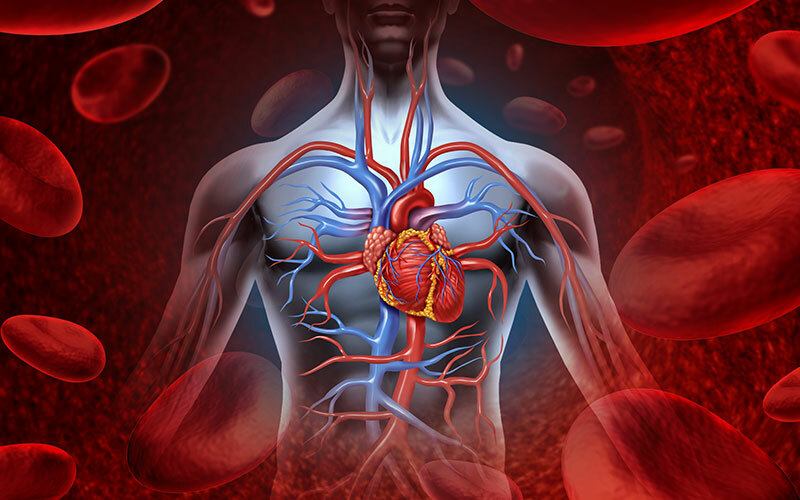 You can develop a clot in the heart, and that clot can actually travel from the heart and end up lodged in a brain artery, causing an embolic stroke. So, two types of ischemic strokes, thrombotic and embolic. The other major category of a stroke is a hemorrhagic stroke or a brain bleed. This occurs when a brain artery actually ruptures and leaks out blood. In the United States, ischemic strokes are more common than hemorrhagic strokes. In fact, 87% of strokes are ischemic, while only 13% are hemorrhagic. Symptoms can include facial weakness, of face drooping. When a person who's had a stroke tries to smile, and only half of their face will smile. You can get arm weakness, leg weakness. You can have a problem with your balance, have confusion, memory loss, dizziness, headaches, blurry vision, numbness. Remember to think FAST, F-A-S-T. If someone has facial drooping, arm weakness, speech difficulty, it's time to call 911, FAST. The pneumonic was actually created in the UK in the 1990s by a group of neurologists, emergency medicine doctors, ambulance personnel. It has since been sanctioned by the American Stroke Association. 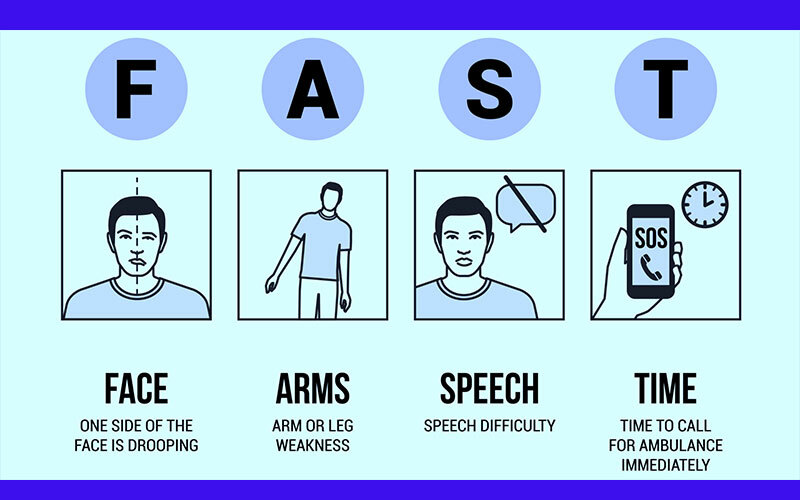 So, to remember the symptoms or warning signs for a stroke FAST, F-A-S-T. The risk factors include high blood pressure, diabetes, high cholesterol, a history of heart disease, a history of atrial fibrillation, and drug abuse can be a risk factor, such as cocaine use. Also, obesity, or a sedentary lifestyle. Another risk factor for developing a stroke is if you've had a TIA. So, what's a TIA? A transient ischemic attack, also known as a mini-stroke. So, in a TIA you develop symptoms of a stroke, but those symptoms last for less than 24 hours, and then they totally disappear. 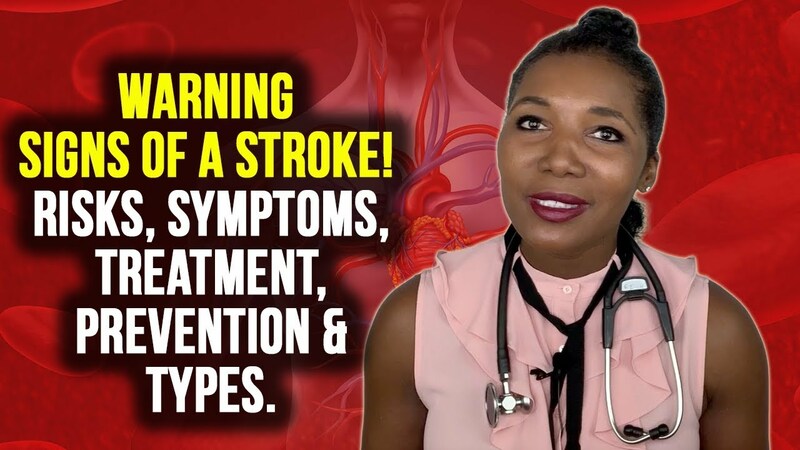 But, it's important because if you have this TIA, this mini-stroke, that is a serious warning that you are at very high risk of having a stroke with potential long term disabilities and effects. Strokes are diagnosed from the history, physical exam, and a series of diagnostic tests ordered by the physician or the hospital group. CT Scans or CAT Scans are pictures of the brain, brain scans, and they help to determine if there are indeed signs of a stroke on that imaging. Also, MRI's of the brain can be done as well. If you are having symptoms of a stroke, a series of tests will be done most likely, including blood work, an EKG to see if you have had signs of a heart attack or atrial fibrillation. They may evaluate your neck arteries, those carotid arteries to see if perhaps you've had an embolic stroke and if you have some type of a narrowing or a plaque in your carotid arteries. The most important thing is if you are having symptoms of a stroke, even if those symptoms go away, you must present to the emergency department. You must activate the EMS, emergency medical system. What Is The Treatment For Strokes? Well, that depends on the type of stroke and it also depends on how long it's been from the time that symptoms occurred, to when a patient actually presents to the emergency department. If you have an ischemic stroke, for example, the treatment may be medications that go in and break up the clots that are blocking the brain artery. But again, that depends on the timing, and it also depends on the patient, whether or not he or she is a candidate for that type of therapy. And then with hemorrhagic strokes, where you have the rupture of the blood vessels, the brain bleeds, you could actually get brain swelling, or a blood clot of the brain, maybe so large that it requires neurosurgery. That blood clot may actually have to be evacuated. So, the treatment really, really depends patient to patient and the type of stroke. Is it important that you consult your physician. Even if you are a healthy person, make sure that you are getting a regular history of physicals, regular checkups to find out if you have risk factors for a stroke. And things that can be done, if you have high blood pressure, make sure that blood pressure is maintained at a normal level. If you have diabetes, make sure the diabetes is controlled. If you have atrial fibrillation, make sure your atrial fibrillation is treated. Basically, you want to decrease your risk factors for strokes. But again, you must consult your physician for the best way for you to prevent strokes. This ends my overview of strokes. I hoped this helped answer the question: what are the warning signs of a stroke? Remember there are two types of strokes, ischemic and hemorrhagic stroke. And you must think FAST. If you see facial drooping, arm weakness, speech difficulty, it's time to call 911. As always, I want you to make sure you remember to take care of you, prioritize yourself. No matter what you're running around doing, if you don't take time to prioritize your health, you may not be around to enjoy the fruits of your labor. So, take care of you, and do your best to live your healthiest, happiest life.